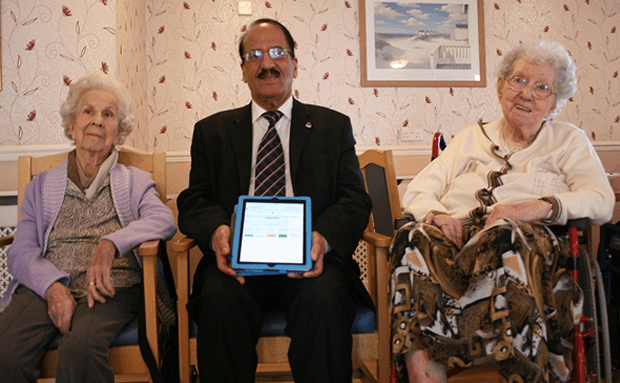 Blackburn with Darwen Council’s Safe and Well Programme working in partnership with BES Healthcare are currently piloting “BAM Labs Technology” at Acorn House Care Home in Blackburn. Turning any bed into a “Smart Bed”, BAM Labs Touch Free Life Care (TLC) sensor mat is an innovative and modern system, which when placed under any bed mattress continuously detects heart rate, breathing rate, motion and presence. The system then transmits data seamlessly to the BAM Labs cloud based platform. It enables caregivers to receive, direct to their PC or mobile devices, health data and alerts about their clients in care. Using the BAM Labs System, healthcare professionals and caregivers, while performing their other duties can monitor a group of clients continuously. They can also review long term trend data for sleep patterns, resting heart and breathing rate and sleep quality to identify adverse changes in health for early intervention. It is also planned that these devices will also be used as part of the re-ablement programme, where people who have spent time in hospital are able to return to their homes thanks to the extra assistance and equipment to help them live an independent life. The equipment will be introduced to other residential homes in the borough over the next 12 months – Branch Court, Moorland View, Longfield, Hollymount, St James House and Northwood. Cllr Mohammed Khan, Blackburn with Darwen Council’s Executive Member for Health and Adult Social Care, said: “Safe, secure and comfortable care is vital for all elderly residents of the borough both in residential care and their own homes, and the Council is committed to help people do this through improvements in technology and care. “These advancements enable older people to enjoy their retirement with the help of superb facilities, which, along with the success the Council’s Telecare service, has helped many people enjoy a real peace of mind and helped them to enjoy their lives more knowing they have this equipment in place. It also helps staff in a huge way, allowing them to respond to the needs of residents straight away.